VANCOUVER—The Christy Clark government has asked Ottawa to lift a ban on burning oil to deal with spills, proof that Christy Clark is prepared to do anything to allow a seven-fold increase in tanker traffic on B.C.’s coast, say the New Democrats. “Christy Clark says she has more work to do on oil spill response with the federal government before she can say yes to the Kinder Morgan pipeline project. That work includes permission to set the ocean on fire and use toxic chemicals to deal with catastrophic oil spills in B.C. waters,” said George Heyman, New Democrat spokesperson for the environment. A letter from Christy Clark’s environment minister, released on Nov. 30, asks the federal government to “consider lifting the ban on… dispersants and in situ burning” of oil spills off of B.C.’s coast. “Christy Clark told people she’s almost ready to sign-off on a 700 per cent increase in oil tanker traffic through our harbour, and we’ve learned her idea of protecting our coast is to set the sea on fire and douse oil spills with toxic chemicals,” said Heyman. 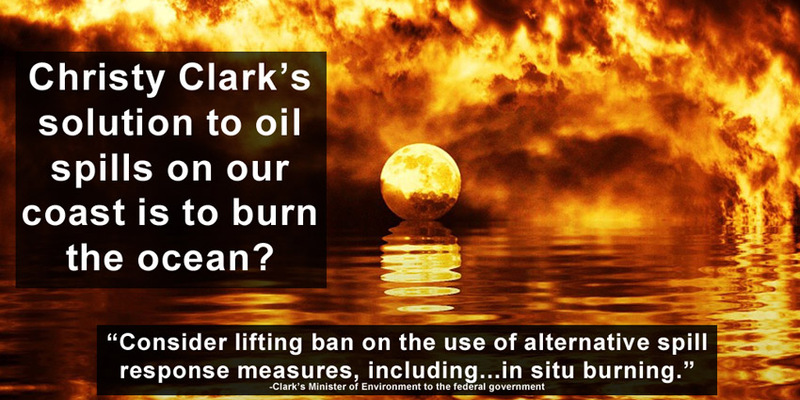 “The fact that Christy Clark wants to end the federal ban on burning oil slicks and toxic chemicals makes it very clear that she’s more than willing to risk our coast and put seven times as many oil tankers through Burrard Inlet and the Salish Sea. If that’s the best Christy Clark can do, we’re in real trouble when it comes to ‘world-leading’ oil spill response. Heyman said Christy Clark failed to protect B.C. interests when she gave away the environmental assessment responsibility for the Kinder Morgan proposal to the federal government. “Christy Clark agreed to put B.C. on the sidelines during a secretive and inadequate environmental review, even though she knew a seven-fold increase in tanker traffic would put our coast and thousands of good jobs that depend on it at risk,” said Heyman. “New Democrats have said all along that this project wasn’t worth the risk. The Christy Clark government’s letter shows that she has accepted that B.C.’s coast is at risk of being sacrificed for a project with few benefits for British Columbians. “Some messes can’t be cleaned up – they need to be stopped before they happen,” Heyman said.